The Great Southern White butterflies emerged from their chrysalides this morning. After they emerge they just hang around and dry their wings for a while. When they start getting restless and flapping their wings it’s time to take them outside and let them go. My daughter has been carrying them around the house in the container and studying them. The Great Southern White butterfly has blue-tipped antennae. It looks really cool and a little alien. This butterfly is common across southern Florida. They lay their eggs on saltwort leaves. The pupa of this butterfly is camoflauged…it looks like a bird dropping. In the caterpillar stage they eat pepper-grass and saltwort. We bought the container in the above picture from a vendor at a lovely farmer’s market in Winter Park, just outside of Orlando. This was a beautiful market that we will go out of our way to visit again. I paid $24 for this butterfly container because it came fully furnished with everything, including caterpillars. We had to have it. We will reuse it again and again. You can’t see it in my picture, but the top is a screw top with a wire mesh screen built into it for ventilation. We did build our own butterfly habitat with a soda bottle and an empty butter container in about five minutes (see yesterday’s post). However, we can never have too many. 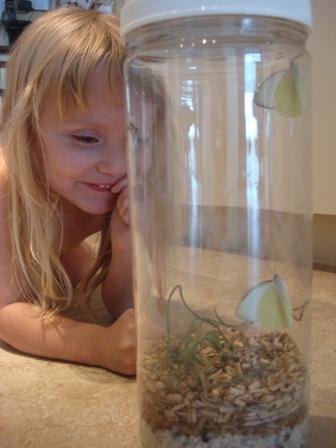 The kids are able to study the butterflies and their cycles by using these containers.